We’ve all been there. You’re occupied taking care of business around the cave, maybe cooking dinner or just lying in bed (or, ahem…on the toilet) when suddenly someone is at the door. Is it a neighbor? A package delivery? A solicitor? You don’t want to stop your activities to go check but you don’t want to turn away a potential important visitor either. The SkyBell HD is the solution to this first-world problem. Video doorbells have been increasing in popularity over the past few years, but have had trouble really catching on due to technical limitations such as video quality and reliable network connectivity. However, now that basically everyone has broadband internet and smartphones, video doorbells are available for the masses. SkyBell has capitalized on this niche with an affordable, high-quality video doorbell that nearly anyone can use. 6 What Are Some Common Concerns With The SkyBell HD? 7 What If Someone Steals My New Expensive Doorbell? The SkyBell HD comes in a brushed aluminum housing with a simple layout. You can choose from either a silver or bronze finish. It’s weatherproof too, so there’s no need to worry about it being damaged by rain. It works in temperatures as cold as -40 °F and as hot as 140 °F. So unless you live in an igloo or a hut in the desert (and if you do, maybe consider moving somewhere more temperate? ), you can be assured that the SkyBell HD will serve you well. The SkyBell HD also includes a microphone and speaker located at the bottom of the unit. Use them to communicate with your visitor straight from your smartphone, even when you’re not home! The main issue for SkyBell HD’s predecessor, the SkyBell 2.0, was poor video quality. It often didn’t give a clear enough picture for viewers to identify their visitor. The SkyBell HD has been upgraded with a full 1080p camera, so this is no longer the case. When viewing the camera feed on your phone, you can even pinch-to-zoom up to 5x. It has a wide angle lens which lets you see a full 180° of your porch. The SkyBell HD is also equipped with color night vision that lets you see up to 15 feet away, which users have so far reported to be excellent as well. The SkyBell HD requires a minimum of 1.5Mbps upstream bandwidth from your internet service provider. This is to facilitate video streaming to your mobile device when you are away from home. Anything less and the video will appear choppy or degraded. If you already have enough speed at home to watch Netflix without hiccups, you may think you’re good to go, but that uses downstream bandwidth. Do not confuse the two; double check with your provider to make sure you have at least 1.5 Mbps upstream and avoid the hassles one Amazon reviewer endured to figure out this issue. Run a speed test to see what your actual throughput is, ideally from your phone, near where the SkyBell HD will be installed. One of the best features of the SkyBell HD is its FREE cloud video hosting service. Once your account is set up, SkyBell automatically saves video segments whenever someone rings the doorbell or triggers the motion detector. So, even if you don’t see the alert when it happens, you can always review your visitors later. The Ring Pro video doorbell offers this service too, but it will cost you $3 per month. We’ve already mentioned the minimum 1.5Mbps upstream bandwidth requirement, but in addition, you’ll need a WiFi router capable of connecting with the 2.4 GHz band. This is the most common WiFi mode. Most routers purchased in the last 10 years should have this capability. Installing the SkyBell HD is a breeze. It should fit cleanly over the space and use the same screw holes as your old doorbell. However, it does come with a drill bit and screwdriver just in case you need to make modifications. Installation consists of first, mounting the backplate and connecting the wires from your old doorbell onto the screw posts. Then snap the faceplate over the top latch and secure it at the bottom with an included security screw. It’s advisable to use a manual screwdriver for this, as some users have reported stripping their screws when using a power driver. One important thing to note regarding the wiring: If you already have a mechanical analog doorbell chime, you should be able to simply swap out your old doorbell for the SkyBell HD. However, if you are chimeless and wish to remain so, you’ll need to wire a 10Ω/10W resistor in its place. 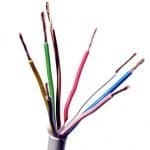 See this page for wiring diagrams. Once this is done, make sure your Apple or Android smartphone is connected to your WiFi network and download and launch the app. It will scan for the new SkyBell HD and configure it to use your network. The smartphone app for SkyBell is arguably the most important aspect of the product. 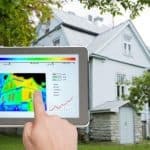 The app is available for Apple and Android devices and lets you control settings like the LED color, the motion detector sensitivity, indoor and outdoor chimes, and more. One nice feature is being able to disable the indoor chime altogether. This might be a useful feature if you have a baby trying to sleep or a dog that goes into a frenzy when someone is at the door. If you have multiple SkyBells, each one is listed in the app and can be viewed in real time anywhere you have an internet connection. Users report getting notifications within two seconds after the button is pressed on the SkyBell. The app also supports multiple users. However, only one person can view each camera at the same time. While Apple and Android versions are available, the trend as of this writing seems to be that the Apple side has better development, coming out with more frequent updates. The app also lets you integrate SkyBell with other smart devices you have in your home. SkyBell HD will Work With Nest, can talk to Amazon Echo, and has a channel on IFTTT. 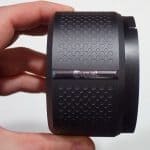 What Are Some Common Concerns With The SkyBell HD? Now, so as not to seem like we’re only singing the SkyBell’s praises, let’s take a look at some of its shortcomings. One of the biggest complaints online about the SkyBell HD is the out-of-the-box motion detector sensitivity. It would seem that sensitivity is set to the maximum by default. It’s supposed to trigger when someone stands in view of the camera for 10 seconds. This means that passing cars or pedestrians on the sidewalk should not trigger an alert. But, several reviewers online reported that this is exactly what happened. One customer grew so annoyed by constant alerts that he had to disable the motion detector altogether. Of course, this defeats the purpose of the SkyBell in the first place. Sensitivity can be adjusted down from within the app, but at the lowest setting, it’s almost impossible to trigger it, again, defeating the purpose. This is something that will likely be patched in a future app update. SkyBell HD is designed to work with smartphones only at the moment, and while their FAQ states that they are working on a web-based desktop app and considering a Windows Mobile app, these options don’t exist yet. So if you still, in 2016, don’t have a smartphone, you may want to move that ahead of a video doorbell on your priority list (just a suggestion). The same goes if you have an aging router. While technically compatible, older routers are likely to be less reliable, and if your WiFi or internet goes down while you’re not home, your video doorbell will not have any way to stream video to you. Your regular doorbell will still work, but if you’re not home that won’t be of much use. So save yourself a potential headache and get yourself a new router if your current one is more than a few years old. What If Someone Steals My New Expensive Doorbell? One last item to mention is Skybell’s Theft Guarantee. Users were concerned about installing a pricey video doorbell outside. A thief could simply remove the single security screw and take it. The company’s answer to this is their guarantee that if this happens to you, just file a police report and send it to their customer service department. SkyBell will send you a free replacement, as well as remotely disable the stolen one, so it will be of no value to the thief. All told, the SkyBell HD is incredibly feature-packed and I had to really nitpick to find things to gripe about. 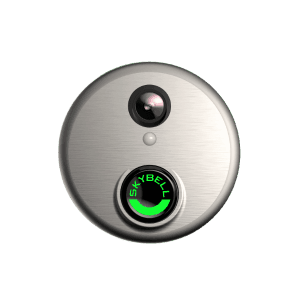 Pair the SkyBell HD with a compatible smart lock for your door and you have yourself a virtual remote doorman. It could be capable of identifying, speaking to, and even unlocking the door for a guest if desired. And, it could all be done from the comfort of, well, wherever you are. Try out the SkyBell HD and never miss a package or be interrupted by a solicitor again!